Is this what we've come to? 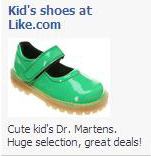 Clothing companies, under fire for exploiting children, are now going around stealing the shoes from their feet? And not only that, but they're also specifically targeting adorable tykes? Copyeditor General's ruling: If you see a cute kid wearing a single green Doc Marten, tell him I know where the other one is.